Take a pan and heat ghee. Add rice flour and sauté it till it turns light brown. Add sugar, vanilla essence, drinking chocolate, cocoa powder and mix it. Add fresh cream and mix it well. Cook it on a low flame for 2-3 minutes. Add cashew nuts and mix it. Let it cool slightly. 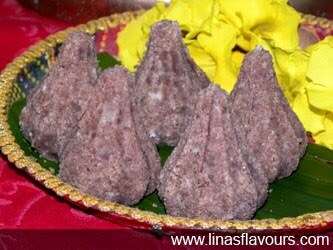 Take about 3 tablespoon of mixture and shape it into a modak. You can also use a mould to shape it. Prepare all the modaks in a same way and let it cool completely. Note: Instead of drinking chocolate and cocoa powder you can use chocolate sauce or dark chocolate also. You can store this for 3-4 days.